Westfort Filtered Cigars are a premium quality brand designed with exceptional smooth all-natural tastes and flavors, making them great for when you want to enjoy a good smoke at your leisure. 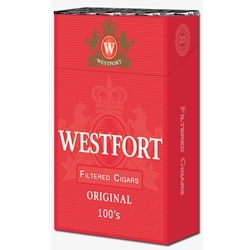 Equivalent to any major retail brand, Westfort Filtered Cigars are filled with a natural tobacco that is rich in flavor and will give a pleasant aroma and smooth finish. A great discount filtered cigar brand at an affordable price! Westfort Filtered Cigars are a great alternative to expensive and over-priced retail brands. Here at Smokers Discounts we’ve made it easy and affordable to buy filtered cigars online. Call us for more details!